As we stepped out of the Piccadilly Circus tube station all exhausted from the six-hour train journey from Edinburgh to London, we were greeted with a rush of cold air, a typical English October afternoon. Just a few minutes walk and we were at the landmark Le Meridien Piccadilly London famous for its timeless Regency Architecture. Standing tall in the West End of London, this palatial structure is one the finest luxury hotels in London. A huge revolving door and a smiling concierge welcomed us to the hotel and quickly took our luggage from us, to be sent to the room. The hotel staff was prompt enough to complete our check-in formalities quickly and we were handed our key cards for the room. Our room was a Deluxe Room on the first floor overlooking the bustling street. The interiors were tastefully done and looked elegant and classy. Swiping the keycard to enter a hotel room always comes with a combination of excitement and suspense wondering how would the room turn out to be, is it worth the money that you have spent? We weren’t expecting a big room considering the fact that real estate is pretty costly in London but to our surprise, we stepped into a spacious room which was a welcome surprise. Complimentary drinks and two yummy Le Meridien Eclairs were kept on the study table for our welcome. Deluxe rooms are furnished in an Edwardian style with elegant and traditional décor. The Room had a theme of black, white and silver which created a soothing contrast and in addition to it was a bright red chair to add some color. It had a queen size bed with a comfortable mattress and soft pillows, a study table, a standard 32 inch TV along with an entertainment system, couple of chairs and a teapot. Hanging ceiling lamps and side tables on either side of the bed completed the decor of the room. The bathroom was big and spacious with a huge Piccadilly themed mirror. A little disappointed that it did not have a bathtub but there was shower unit. All the products in the bathroom were from Cinq Mondes complimenting the look was a white soft robe. Breakfast at Le Meridien is a lavish affair with the choicest of fruits, muffins, cakes, cheese and the mouth-watering Le Meridien signature Eclairs as a part of the spread which is served at the Terrace Grill Restaurant. Having breakfast here can be pretty invigorating during a sunny day with plenty of sunlight beaming through the glasses. Perfect for hanging out for an afternoon tea on a gloomy London day. Piccadilly Health Club & Spa is situated on the lower ground floor of the hotel and it has the largest indoor swimming pool in Central London. We could not resist ourselves going for a dip into the pool after a long and tiring day sightseeing but we had to miss the spa due to lack of time. Location is another highlight of the hotel and is a perfect base to discover everything on foot, so being centrally located in one of the biggest luxuries. Centrally located to many tourist attractions which can be traveled by foot. You could either walk or take a tube to visit Hyde Park and the Buckingham Palace. If you want to do the touristy thing of taking a bus tour of London city then you can walk to the Green Park Tube station where the tour begins. 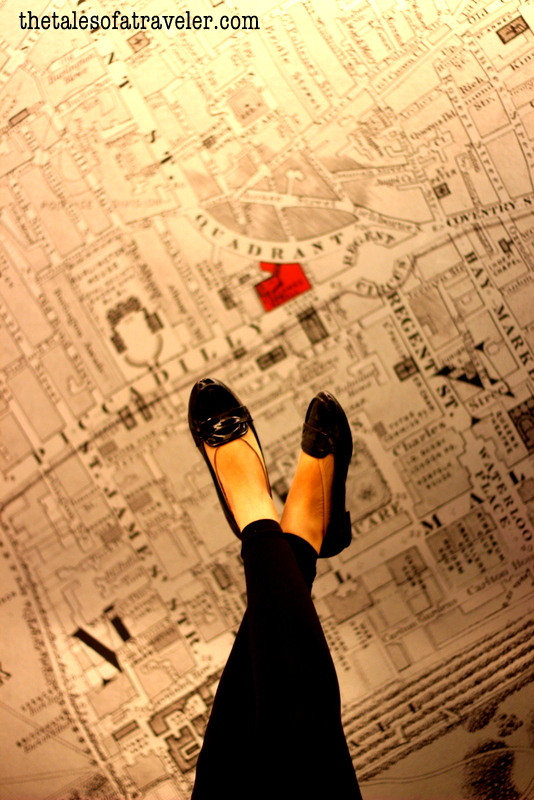 The entire stretch from the hotel unto Oxford circus is lined with designer boutiques, cafes, bars and restaurants. A Shoppers heaven. Yes, definitely it a perfect base for both business travelers as well as families and couple alike even we wanted to extend our stay for few more days but the hotel was completely sold out. It was an absolute delight from start to finish. Loved the welcome Eclairs and goodnight chocolates. One of the best places to stay in London with the friendliest staff. Room rate starts from 20,000 INR for a classic room. Be a part of our journey on Facebook, Twitter and Instagram for more travel stories, ideas and photos from around the world. We were guests of Le Meridien Piccadilly, London and all views (good and bad) are entirely our own. London is way too expensive 😉 but it was a bful property to stay right at the center of West end London .. Pretty Lovely Boutique hotel.. nice pics! That’s a great review. The Hotel looks beautiful!!! But yeah, London is so damn expensive! Oooh the hotel looks lovely… such luxury in London/Europe is something outstanding considering most hotels tend to be very basic. I loved the view and the feel of the breakfast lounge. I have lived in London for 2 years and you have surely brought the old memories back. Great Post and yes London is very very expensive mahn.. Check out our Lifestyle too. Looks like an amazing place to stay next time we go to London. The big indoor swimming pool sounds great after a long day. The locations is veryconvenient as well. Good find. This hotel is beautiful I would love to spend some time here. The decor is dramatic and stunning. I would love a soak in that pool you talked about! Le Meridien looks like the perfect place to stay in London. I like how spacious the room is, I’ve never had that in a London hotel before. The breakfast buffet looks like they have a good selection. This is good as the energy will be required to explore the sites of London. Beautiful article and amazing photos! Thank you! London is great! Very much the kind of place I’d love to stay in!